As Ric Flair would say, “WOOOOOOOOO.” If the UFC Glendale main event between Dustin Poirier and Justin Gaethje doesn’t get you amped up, you’re not a fight fan. When these two lightweight action heroes step into the Octagon, sit more than an arm’s length away from someone, make sure there’s nothing breakable around, and stretch, because you will likely be jumping up, throwing punches, and making a lot of noise. This is what fighting is all about, and as far as a prediction goes, I’ll just say, “May the best man win.” I want to enjoy this fight, not analyze it. Speaking of fights I just want to sit back and enjoy, Carlos Condit vs Alex Oliveira fits the bill as well. Yes, Condit vs Matt Brown would have been special, but Oliveira is just as aggressive and just as willing to take risks in the Octagon, and he may be the perfect fighter to bring out the best in “The Natural Born Killer” in Saturday’s co-main event. After his memorable UFC debut earlier this year, Israel Adesanya was seen as the greatest thing since pizza, and he may end up being that. But I’m guessing he’s going to get a tougher than expected scrap out of Marvin Vettori. Yes, Vettori’s UFC run has been erratic, but he’s got the style to give Adesanya problems as long as he doesn’t get drawn into a standup battle. If he does get goaded into trading with “The Last Stylebender,” it may turn into a rough night. 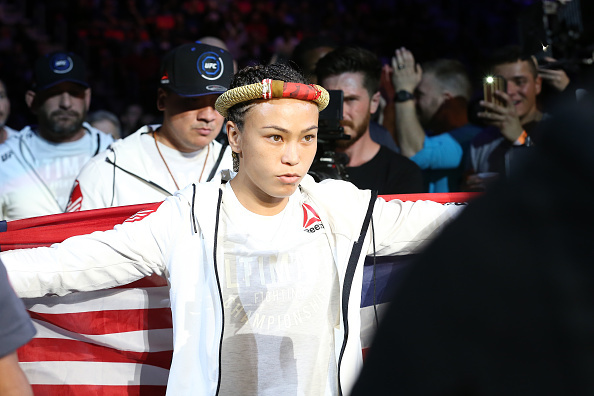 Michelle Waterson has the better record and the better ranking heading into her bout with Cortney Casey, but “Cast Iron” may end up pulling off the upset on Saturday. Simply put, Casey is an unofficial Diaz sister, and she’s hungry for the biggest opportunity of her career and to put the bad luck she’s dealt with over the years out of her life once and for all. Expect a barnburner. I thought Alex Garcia was going to stand with Muslim Salikhov in their fight. Garcia didn’t, surprising me, and especially Salikhov, who ended up getting submitted in his UFC debut. This weekend, “The King of Kung Fu” faces Ricky Rainey, and I think “The Sniper” is going to stand with Salikhov. This time, I’m pretty sure of it. And if I’m right, which is never a done deal, Salikhov will likely impress for as long as this fight lasts. Glendale, get ready. This should be one of the fun ones on Saturday’s card, and you can thank Tim Boetsch for that. “The Barbarian” always comes to fight, and win or lose, you’re probably going to remember the bout. Yet while he’s coming off a knockout of Johny Hendricks, the general consensus is that if Carlos gets Boetsch to the mat, it’s a wrap. Then again, Boetsch has upset the apple cart before, and I get the feeling that he enjoys it. Flyweight contenders Wilson Reis and John Moraga are coming at this bout from different directions, with Reis coming off back-to-back losses and Moraga coming off back-to-back wins. So take momentum and add in a home game in Arizona, and Moraga has to be the favorite, but Reis is no one to be slept on, especially if the fight hits the mat. The Krzysztof Jotko-Brad Tavares fight hasn’t received a lot of attention, but in a wide open middleweight division, it’s an important fight, and both veterans know it. So while neither is stacking highlight reel clips, they’re as steady as it comes on fight night, and now is not the time to deviate from that. The last time I thought a short notice debut was too far to climb for a UFC debutant, Alexander Hernandez knocked out Beneil Dariush. So while Gilbert Burns is a top lightweight with a deadly ground game as well as some heavy hands, I can’t dismiss newcomer Dan Moret, because with four-ounce gloves and two well-trained mixed martial artists, anything can happen. The new women’s flyweight division is starting to take shape, and while several contenders are already established, the next generation is jockeying for position, and Shana Dobson and Lauren Mueller get their chance to make a statement this weekend. Dobson made huge leaps from her time on The Ultimate Fighter to her finale win over Ariel Beck, and more are expected after a full camp with Team Lloyd Irvin. Mueller has also been putting in time with a top-notch team in Alliance MMA, and fighting and winning on Dana White’s Tuesday Night Contender Series should temper the first-time UFC jitters a bit. Yushin Okami has competed at 185 and 205 pounds in the Octagon, and Saturday night, he will make his first UFC start at 170 pounds against Dhiego Lima. It’s not a first-time thing for “Thunder,” as he went 4-1 at welterweight before returning to the UFC last September for a short-notice bout against Ovince Saint Preux. And while he’s the favorite here, Lima is hungry for his first UFC win since 2014, so expect to see him bring his best on Saturday. Arjan Bhullar has received a lot of attention since signing with the UFC last year, and he’s dealt with it all like a true pro, meaning that now he can focus on making the moves he needs to climb the heavyweight ladder. Poland’s Adam Wieczorek is the perfect test for him at this point in his career, and if Bhullar can leave Glendale with his hand raised in the Octagon for a second time, the division will be put on notice that he’s arrived. How under the radar is Mexico’s Alejandro Perez? He’s 4-0-1 in his last five but still hasn’t made his way into the top 15 at bantamweight. That should change if he can defeat the talented Matthew Lopez. Lopez was on a nice little streak, beating Mitch Gagnon and Johnny Eduardo before a battle with the scale and Raphael Assuncao last November. If the cut to 135 pounds isn’t an issue this time, Lopez has the goods to hand Perez his first loss since 2015. A very interesting bantamweight battle opens up Saturday night’s card, with Patrick Williams squaring off against Luke Sanders. Both have had their bouts with inactivity, making it hard to get a true read on where they’re at heading into this one. Williams has been on the wrong end of a flying knee knockout courtesy of Chris Beal, finished Alejandro Perez by submission in 23 seconds and gave Tom Duquesnoy some trouble before being stopped, proving that you never know which version of “The Animal” is showing up. As for Sanders, he picked up a Performance of the Night win over Maximo Blanco, was putting it on Iuri Alcantara before getting submitted, and he then got stopped by Andre Soukhamthath. Our conclusion? Just watch it, because it should be exciting. But picking this one is nearly impossible.